Lindsey in her vintage 80's Valentino dress with her Daffy's boots. I love how she matched up the boots with this very feminine, 80's dress. 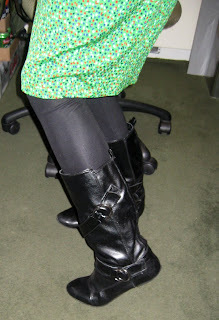 Lindsey, too, works outside a lot, and these boots are, in her words, perfect to run around the city in. Exactly. Thanks for doing my work for me guys! I have such great co-workers. Just don't ask me to paint any trash cans or nothing in return, kay? Hi there-Lindsey looks oh so fabulous, a really lovely ensemble! thanks for the well wishes too! Love the dress and those boots are to die for!